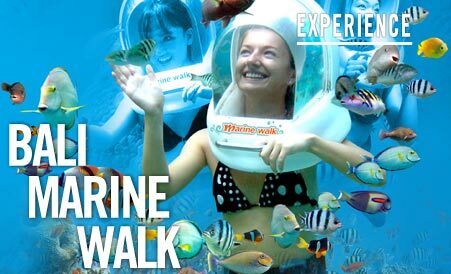 Walking on the ocean bed, admiring the beauty of a sea garden, colourful corals, playing with bright fish , and feeding them from your hand are some of the experiences that you would have when making use of our Marine Walk facility. With the Marine Walk Super Boat option, one could easily commute to the white sandy shores of Lembongan Island which is a mere 30 minutes away making for quite the excursion among the best places to visit in Bali. Children age from 8 - 12 years , Age 8 untill max 70 years. Central area Ubud as USD 15/Car, Tanah Lot&Candi dasa as USD 25/Car.